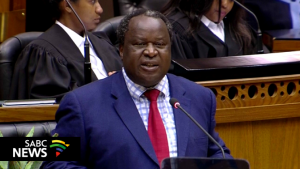 Delivering his Budget Speech in Parliament, Cape Town, on Wednesday, Minister of Finance Tito Mboweni says government has projected a revenue shortfall of R42,8 billion for the 2018/2019 period. This is compared to an estimate of R27,4 billion in 2018. He says it’s high time we are frank with the facts and the figures. The 2019 budget has focused, amongst others, on increasing tax collection for the country, however the minister has being dealt the blow of acceding that tax revenue from the South African Revenue Service (SARS) has been revised down by R15.4 billion for 2019.
increase by between 7.4 and 9%, whilst the the general fuel levy will increase by 15 cents per litre to R3.52 per litre of petrol and to R3.37 per litre of diesel. Mboweni has made no changes to personal income tax brackets. However in trying to increase revenue for the country, treasury will from the 1st of June 2019 introduce a carbon tax. Below-inflation increases in fuel taxes together with the carbon tax on fuel will raise R1.3 billion. Government has increased its expenditure ceiling is increased by R16 billion over the next three years. The bulk of spending is allocated to learning and culture, social development, health and community development. The Minister has highlighted that one of the fundamental prescripts of the 2019 budget is to stabilise and reduce government debt. The post [WATCH]It will not be easy to fix the economy: Mboweni appeared first on SABC News – Breaking news, special reports, world, business, sport coverage of all South African current events. Africa's news leader..